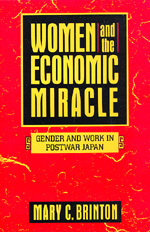 This lucid, hard-hitting book explores a central paradox of the Japanese economy: the relegation of women to low-paying, dead-end jobs in a workforce that depends on their labor to maintain its status as a world economic leader. Drawing upon historical materials, survey and statistical data, and extensive interviews in Japan, Mary Brinton provides an in-depth and original examination of the role of gender in Japan's phenomenal postwar economic growth. Brinton finds that the educational system, the workplace, and the family in Japan have shaped the opportunities open to female workers. Women move in and out of the workforce depending on their age and family duties, a great disadvantage in a system that emphasizes seniority and continuous work experience. Brinton situates the vicious cycle that perpetuates traditional gender roles within the concept of human capital development, whereby Japanese society "underinvests" in the capabilities of women. The effects of this underinvestment are reinforced indirectly as women sustain male human capital through unpaid domestic labor and psychological support. Brinton provides a clear analysis of a society that remains misunderstood, but whose economic transformation has been watched with great interest by the industrialized world. Mary C. Brinton is Associate Professor of Sociology at the University of Chicago.